Urbana University’s Matt Treacy (21) shoots a jumper against visiting Wheeling Jesuit on Saturday. The Urbana University men’s basketball team edged Wheeling Jesuit, 77-73, in a back-and-forth MEC battle Saturday afternoon at the Grimes Center. UU (2-5, 1-3 MEC) trailed by four in the final minutes, but came back to even the score at 67-67 on Jordan Bradley’s jumper with 4:11 to go. 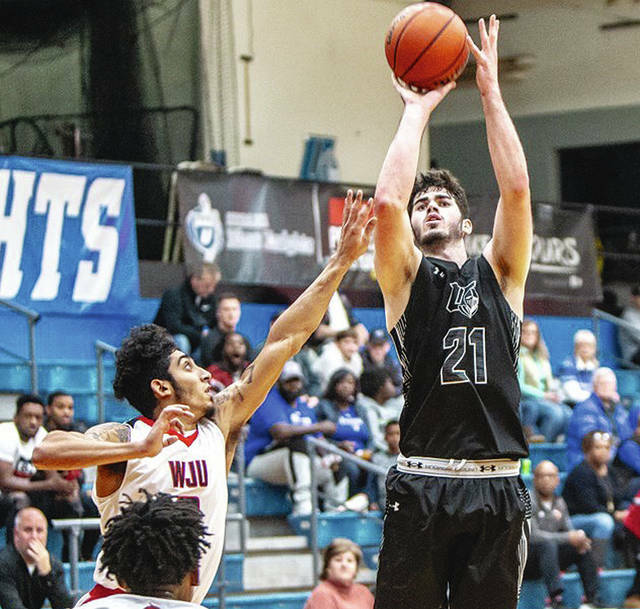 Two minutes later, the Blue Knights took advantage of a missed WJU jumper as freshman Matt Treacy buried a go-ahead three to put UU ahead for good at the two-minute mark, 72-69. The Blue Knights went 3 of 4 at the line down the stretch and then Datrey Long sealed the win with a breakaway dunk with under a minute left. Malik Jacobs led the way with his second career double-double on 18 points and career-high 12 rebounds. The senior also collected three steals, three assists and two blocks. Bradley followed up his career performance last Wednesday with another solid outing. The junior point guard scored 16 points on 7-of-8 shooting and went 2 of 3 from beyond the arc. Junior forward Mike Ryan also reached double figures with 11 points off the bench while junior guard Ethan Snapp and Treacy each chipped in with eight points. The close contest saw neither team go up by double digits as the Cardinals claimed the largest advantage of seven points, 18-11, early in the first half. However, the Blue Knights responded when Triad graduate Hadley LeVan knocked down a 3-pointer to even the score at 22-22 with 10:40 remaining in the opening stanza. UU claimed a 40-38 halftime advantage after shooting 52 percent over 20 minutes. The Blue Knights finished with an overall team shooting percentage of 50 percent (30-60) and shot 39 percent from range (9-23). WJU finished shooting at an overall clip of 48 percent from the floor. The Blue Knights utilized their athleticism to outscore the Cardinals 23-9 on fast-break points. In addition, UU outscored WJU, 20-6, in bench points. WJU’s Tariq Woody was unstoppable in the paint with 25 points and 18 rebounds. Franck Kamgain also scored 20 points for the visiting Cardinals. UU will host the University of Charleston (5-3, 1-3 MEC) Wednesday night with tipoff scheduled for 7:30 p.m. inside the Grimes Center. The Golden Eagles defeated UVa-Wise at home on Saturday, 81-73.
https://www.urbanacitizen.com/wp-content/uploads/sites/36/2018/12/web1_treacy.jpegUrbana University’s Matt Treacy (21) shoots a jumper against visiting Wheeling Jesuit on Saturday.